GHOST STORY: Who is the shadow in the window of the abandoned house, and what or who is he waiting for? THE AWAKENING: It's time for Sabrina to wake up and face the light. END OF THE LINE: Cassie wants to die. When midnight rolls around, she stands on the tracks waiting for the train to come. MILSA LORIS: The once magnificent kingdom of Milsa Loris comes alive one night each winter. The King's witch is brewing up a little magic, sure to make the soup all the tastier. THE OLD VAMPIRE: Hailey spent her life dreaming of a dark prince falling in love with her. He never showed up, until now. THE KNOCKING: Alison's grandfather has one eye on the next life. After all, he's heard a lot of rapping at his door lately. THE BOY ON THE BEACH: Kate's grandmother warns her about the boy with the green eyes. Will she pay heed? SNOWGLOBES: It's busy at Calvin's Cabins this Christmas. Eddie and Maggie are a young couple in trouble. Not to fear, Calvin is always ready to lend a hand. I really enjoyed this collection of eight different short stories, I saw potential full length novels in each of them. But I do have a few favourites of mine, of course. "End Of The Line" at some point kinda reminded me of an episode from Tales From The Dark Side (if you're familiar with this TV series, you know which one I'm referring to), but the story takes a total different path and I liked the way the author handled such a delicate subject. "Milsa Loris" has definitely that story-tale charm impossible to resist and it's magically dark, like Sleeping Beauty dark. Then there's "The Old Vampire". All I'm going to say about this one is that female readers can easily put themselves in the shoes of the main character here... Hailey is believable as much as the fact that we all live in a sort of a constant dream status and we would love to have our own vampire. Isn't it so? 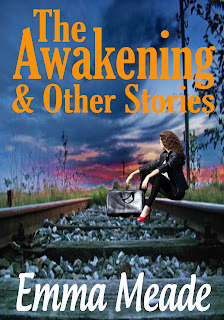 Emma Meade surely excited my curiosity with every story, but it's with "The Awakening" that she has done a particularly great job. Why? Because I wouldn't change the length of it a bit, it's mystic and winning as it should be. Well done, Emma!